Painting your garage door can be part of some home improvements or a sudden decision to make fundamental changes in the style and appearance of your home. In either case, it is important to choose the right colors for your particular taste, as well as to use a material that will provide your door with that added layer of protection it so justly deserves. The shade could match or contradict the rest of the house but, in either case, it must give a nice result, which won't be boring but interesting. Traditionally, softer shades are better because they are easier on the eyes. There are basically two main reasons why people should repaint their garage doors at least once a year and they are equally important. Don't forget that the condition of your garage door, as well as its overall look, says a lot about you - the homeowner - even if it's unintentionally. People tend to make assumptions based on various things they perceive, and while you shouldn't give too much credence to what people think about you, guiding their impressions towards the positive spectrum is generally much more beneficial, especially in the long term. There's also an added security benefit to repainting your door on a regular basis because it will help you maintain its condition. If you have either a wooden or a steel door, annual repainting can actually increase its lifespan. Steel is susceptible to rust over time, which will compromise its good working condition. By applying it with a protective coat of corrosion-resistant material, you'll be able to preserve it for much longer. Wood can enjoy a similar benefit, as while it won't rust, it can rot or warp, and by repainting it annually you'll be able to delay these issues from occurring. Regardless of why you choose to do it, regularly repainting your garage door will be extremely beneficial for both the look and security of your home. While you're doing this, you must remember to cover the exposed parts of your door in order to avoid getting splashes of paint on them. Keep in mind that a small drop of paint in the tracks will have to be dealt with, as it can keep the garage door rollers from sliding properly, and could lead to more serious problems. 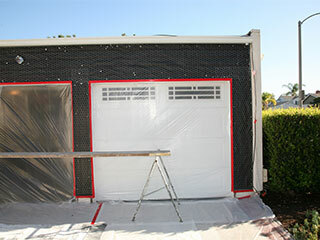 Contact our experts at Garage Door Repair Portland for more useful information.